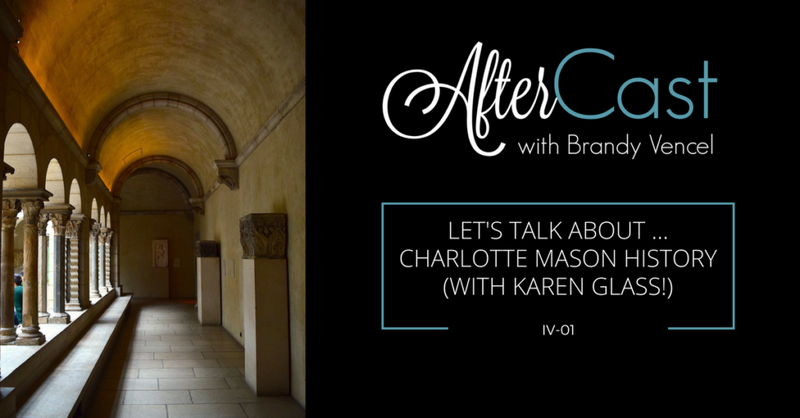 I received a couple questions recently regarding AmblesideOnline, Charlotte Mason, and the teaching of history that made me think of conversations I’ve had in the past with Karen Glass. I decided to use them as an excuse to have a conversation with her and record it for AfterCast. That’s what I’m presenting to you today. Karen is the author of Consider This: Charlotte Mason and the Classical Tradition, and also the brain behind Mind to Mind, an abridgment of Charlotte Mason’s sixth volume. Karen Glass is part of the Advisory of AmblesideOnline. 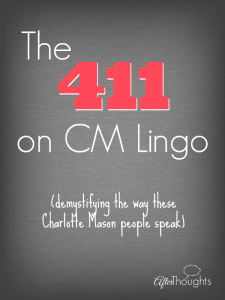 She has four children, ages 13 to 27, who have been homeschooled using Charlotte Mason’s methods from beginning to end. 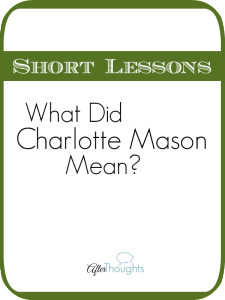 She has been studying and writing about Charlotte Mason and Classical Education for over twenty years. I wanted to know your thoughts on history cycles. Why you like AO 6 year cycle compared to the many others (3,4, 5, 6). Do you think/know that they really know history? Have a good overview? Do you feel they have the “right pegs” to fill in the rest of history as they read/study on their own? Such as they are not memorizing a timeline like CC or Veritas? 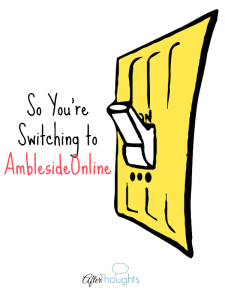 My oldest has completed Years 1 and 2 of AmblesideOnline and we actually did the first term of Year 3 last year. I am feeling muddled in my head, though, regarding history. It is probably a pedagogical problem on my part, but I worry that my son is not getting a strong sense of the broad sweep of history, chronologically and geographically. We are putting events and names on a timeline, and we do consult a map, but I still find myself longing for a more straightforward approach to the big picture and more clarity overall. Can you speak as to your student’s grasp of history, having faithfully done AO? And are there things that I should be doing as a teacher to make things more clear (without lecturing and buying textbooks!) Oh, and we do narrate every reading. But obviously dates and names don’t always sink in. Success! Now check your email to confirm your subscription, which is required to receive your Charlotte Mason History Topical Study. I really like your podcast. Please change your intro music/length of intro music. It is very distracting and music I don’t allow around my home so it’s hard to have your podcast start playing with my children home. Thanks! Is the Parents’ Review article that Karen mentioned (which states that one of the goals of education is to preserve a sense of ignorance) available online anywhere? I’d love to use it in my doctoral research! Thank you, Karen! I definitely want to bring out this point in my Philosophy of Education seminar this semester. This sense of ignorance or incompleteness–humility when it really comes down to it–is so important and so often overlooked as an educational goal. It also puts me in mind of the article by George Grant, when he says, “Education is that unique form of discipleship that brings us to the place of admitting our inadequacies.” I think if we are to define education biblically, we must include humility in the equation. I just want to sit and lap up wisdom from Karen Glass all day long. I will be listening to this again. There is so much goodness here! Thank you both! This is so so helpful and answers so many questions and internal struggles I have had. I am one of those moms who is just starting out. 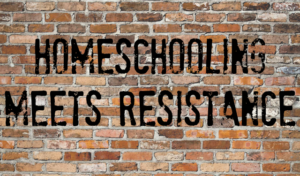 My kids are 6, 5, 3 and 1 and I am in a large homeschooling community. The other mothers I know following Charlotte Mason have older children, but most of my peers are doing CC. I have felt so insecure about our path, but this episode REALLY encouraged me to just trust cultivating care over constructing perfect mechanics. Thank you! Brandy, this was awesome!! Thank you so much for your blog and podcast(s). I really enjoyed getting to read more of Karen Glass during the Boot Camp this summer and this interview was really helpful. Karen was very encouraging. I gained more insight into how AO is set up and why. I also feel like I need to make my way through volume 3. Oh, I’m bummed. I posted a long reply and actually got a message that I posted a duplicate reply and now I don’t see either but I have to run some errands so can’t replace the message! Basically, I have loved AO since I first learned about it 10 years ago and I love it even more after listening to this amazing podcast! Thanks so much for sharing insight into why this rich curriculum has resulted in my kids having a much greater understanding of and connection with the people and places throughout history! My homeschooling sister-in-law (who actually was the one who sent me WTM when I my oldest was 6 months old) was listening to all that I was planning to try to cover with my little 5 year old and very carefully recommended to me that I consider AO instead as I was going to overwhelm my son and myself!! I have never looked back. The richness of the curriculum has been such a blessing even in the midst of my imperfect implementation and this interview provides such a beautiful explanation of WHY it has been such a blessing. I love, love, love the connections and the understanding of people & places that my kids have that I never got from my education! Thank you Karen & Brandy for a fabulous podcast!! I want to be Karen Glass when I grow up. Just sayin’. Seriously thankful for the gracious wisdom that just flows out of her. This was such an encouraging and helpful conversation. Thank-you.